More likely than not, your municipal drinking water has been filtered with activated carbon (AC). Municipal drinking water plants are mandated by the US EPA to purify drinking water supplies in major cities with activated carbon filters. Domestic POU/POE devices rely on activated carbon adsorption. Pour-through pitchers, in-line filters on kitchen faucets or refrigerator cold water or ice-cube makers are becoming standard applications for AC purification. Activated carbon POE units can protect a whole facility water supply, like restaurants or recreational vehicles. All of these applications use activated carbon, which is the best available technology (BAT) to treat drinking water. These activated carbon filters require periodic monitoring to validate their performance. Activated carbon does not last forever and does need to be changed when it becomes exhausted. The new concept presented here is for a low-cost and easy-touse monitoring tool. This has been dubbed the AC tester, which can help maximize performance (Figure 1). Activated carbon is a crude form of graphite, randomly oriented graphitic platelets.1 In drinking water applications, coconut shells and bituminous coal are the major raw source materials to manufacture AC. These starting materials are sized and carbonized, which increases the materials’ percentage of carbon. After carbonization, they are activated to develop porous and microporous structures to provide surface areas of 800 to 1,200 m2/g. This exceptionally high AC surface area is responsible for physical adsorption performance. It is also an asset to improving toxicity, taste and odor removal in water supplies and air streams. (A schematic representation for coconut and bituminous coal based AC is shown in Figure 2). Initial starting granular activated carbon (GAC) adsorption spaces in AC applications have nanometer (nm) sized wall-to-wall spaces called micro-pores. These one to three nanometer-spaced (nm) graphitic platelets provide the strongest adsorptive forces to remove trace soluble contaminants from water or air. Water treatment is done by passing water to be purified through fixed-bed adsorbers containing GAC. In municipal plants, these beds are typically three feet deep, but can go up to nine feet. Historically, sand was used in these water filters to remove suspended solids. Most operations today use GAC as a replacement for sand or anthracite; GAC provides trace dissolved organics adsorption in addition to filtration of suspended solids. Many plants still leave a couple of inches of sand or anthracite underneath GAC. Under the adsorber bed, media is the underdrain system that separates finished water from solid media. After GAC treatment, disinfectants are added. This is done to minimize the formation of disinfection byproducts and provide residual antimicrobial agent to consumers’ water tap. Drinking water plants copiously wash initial GAC before putting it into services2 using American Water Works Association (AWWA) guidelines, as this organization provides much of the leadership for drinking water plant operations. The GAC preliminary water washings remove fine dust and floaters and stratify the bed. This is done by backwashing the bed to suspend GAC particles. When the backwash valve is slowly closed, larger particles sink fastest and smaller particles are located on top of the stratified bed. Backwashing is an important process parameter to remove GAC filtered particles accumulated from influent. Since these GAC filters operate by the force of gravity, removing accumulated fine particulate matter keeps them flowing and avoids development of head pressure. Many GAC filter systems have automatic controllers to ensure routine backwashing. As the name implies, the GAC filter bed is raised by directing water up through the underdrain. The stratified bed is raised about 50 percent to float away the low-density fine particulates filtered out by GAC. This dislodged filtered material is then carried away in a trough above the stationary filter bed. It is important to let backwashed suspended GAC particles settle slowly. This allows larger and heavier GAC particles to return to the bottom of the bed and the smallest, lightest particles to remain at the top when the bed is put back into service. Returning the bed to its proper original stratification maintains the mass transfer zone (MTZ), the region in which the concentration of adsorbate(s) in water decreases from influent concentrations to the lowest detectable concentration. If the operators close the backwash valves too quickly, smaller particles (which have the highest adsorbate loadings) will become stratified throughout the settled GAC bed. Since GAC particles equilibrate with the surrounding water, a dislocated GAC particle deeper in the bed, loaded with adsorbates, can facilitate premature contaminant breakthrough. This idea was reduced to practical application for GAC monitoring.4 The original concept was scaled down to a handheld device (Figure 1). It is easy to assemble an AC tester device. All you need is a reservoir to hold the solvent into which you immerse the AC specimen to be tested and a thermometer to measure the heatof-immersion (HOI) temperature rise. We recommend using mineral oil as the solvent because it is readily available around the globe. It is inert, non-toxic, has relatively low competitive desorption capacity and has a high boiling point. Adsorption heat will thus be maintained in the liquid and not boiled away, if you use a low-boiling solvent. The reservoir should have calibrated, graduated volume marks on its straight edge side . A 30-mL line needs to be marked on the AC tester. A thermometer should be included which has calibrated, graduated marks from 10 to 30°C (50 to 86°F), with marked increments of 0.5°C (32.9°F). It is possible to estimate the AC heat-of-immersion adsorption temperature rise to a tenth of a degree in this simple device. Test methods using this device have been continually used, with new applications still being found. Application for confirming incoming GAC quality and location of mass transfer zones in drinking water activated carbon beds has also been documented. Using an AC tester is designed to be easy, with only low-cost equipment and operator skills required. Typically, a level tablespoon of GAC is sufficient to provide a good maximum temperature rise in about two minutes in the AC tester. It is easy to check incoming loads of activated carbon. Do not rely solely on this easy test, however. Compliment it with official standard AWWA2 and ASTM5 test methods. Vendors provide these standard tests, which can be checked and verified with experienced and qualified laboratories. Compare unused GAC with used GAC sampled from your operational adsorbers. Unfortunately, experience has shown that most activated carbon users do not retain a representative sample of media installed into the adsorbers. This is easy to fix by collecting GAC samples and storing them in clean, airtight containers similar to paint cans. For example, if unused and used GAC both give a 4.0°C (39.2°F) rise in the starting mineral oil temperature, the carbon is like new. But if used GAC has only a 1.0°C (33.8°F) rise, the adsorption space is nearly filled and not likely to be working well. 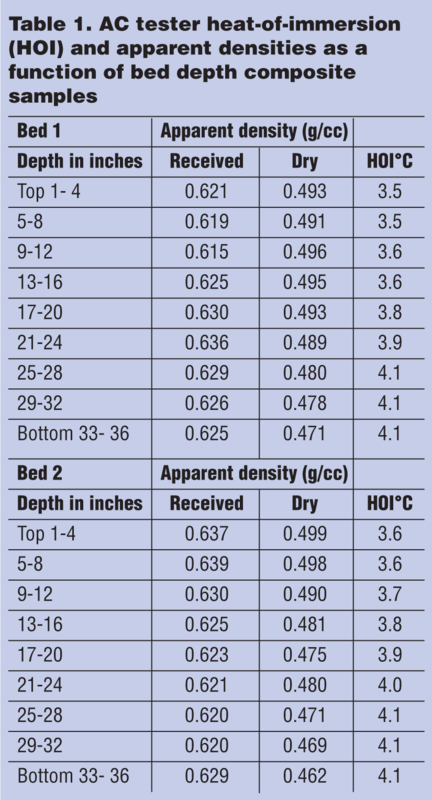 Core GAC samples were taken from two settled GAC beds at a municipal drinking water plant (Table 1). The core samples were placed on absorbent paper to remove bulk water. After air drying, composite samples were taken every four inches from the top of each bed to the bottom. 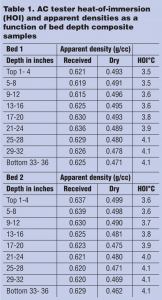 HOI was determined in the AC tester, as well as densities according to ASTM5 (results are reported in Table 1). Whether a large (20,000-pound/9,071-kilogram) AC municipal unit or a small (one pound/0.45 Kg) POU device containing AC is put into service, heterogeneous adsorption spaces are empty. As a water or air stream is passed through, adsorption spaces fill by taking materials out of the passing stream. Eventually, useful adsorption spaces fill, with little or no adsorbate difference between influent and effluent streams. At equilibrium, used AC will have its smallest increase in temperature rise in the AC tester compared to the unused starting AC for that application. Prior articles have described other activated carbon monitoring methods.6,7 The method described with the AC tester is a low-cost approach within official ASTM and AWWA test methodology, 2,5 which are the cornerstones of the activated carbon industry. Such advanced test methods2,6,7 are pushing the carbon envelope. Many more sophisticated test methods are relatively expensive compared to the AC tester. While a practical tool, it needs to be used in conjunction with classical and advanced test methods to help make the best decisions about purchasing and monitoring working activated carbon adsorption systems. AWWA, WQA and other consultants can provide educational programs to help explain these methods and what they provide users. Gravimetric Rapid Pore Size Distribution (GRPD) method can be applied to the unused and used GAC to help reveal the pores which are filled during a particular application.6 Knowing which pores are filled can help select the best AC for the application by using a carbon which supplies the needed pores. The GRPD sister method7 helps to better understand fine micropores, which are the strongest adsorption pores. When users are purchasing large amounts of GAC, the AC tester makes it possible to run many samples at the job site. This test is fast and easy to do. It requires no sample preparation. Sending samples for ASTM and AWWA laboratory testing may take a few days or weeks to get the results back. The AC tester can yield results in a few minutes. By running a lot of incoming samples, this provides a statistical analysis of your newly installed GAC. Manufacturers can use the AC tester at the production line. Getting product quality data in a few minutes after it comes out of the furnace allows operators to have timely information. Instead of sending samples to the lab for iodine numbers to get results the next day, it makes sense to have a nearby on-line quality check for AC products as they come out of the furnace. The AC tester has been found useful for all forms of activated carbon: powder, granular, pellets, fabric, felts, composites and nanomaterials. Pellets are often used in vapor-phase applications because they provide the least resistance to drive air through the bed. To get samples of pellets for the AC tester, lining up 150 to 200 millimeters (5.90 to 7.87 inches) of length provides a reproducible sample to deliver to the AC tester. Tablespoons of GAC are reproducible, but pellets do not pack in this small space reproducibly. Pelleted samples are reproducible on a linear (end-to-end) continuous segment. Activated Carbon Conference. Pittsburgh, PA. October 2002. Carbon ANSI Effective date: March 1, 2006.
service life.” 6th International Activated Carbon Conference and Courses. of Committee D-28 on Activated Carbon 2nd Edition 2000. Henry Nowicki, Ph.D. and MBA, provides the introductory course for the Activated Carbon School titled ‘Activated Carbon Adsorption: Principles, Practices, Applications and Opportunities.’ Dr. Nowicki directs the day-to-day routine and advanced testing, R&D, and consulting services for PACS. He can be reached at (724) 457-6576, by e-mail at henry@pacslabs.com or at the company web site at www.pacslabs.com. Wayne Schuliger, P.E. provides the PACS short course titled ‘Design, Operation and Trouble Shooting Activated Carbon Adsorption Systems.’ He utilizes his 40 years of activated carbon adsorption engineering experiences to help solve client problems through on site and Internet consulting services. He can be reached via e-mail at wayne@pacslabs.com. H. George Nowicki, BS and BA, is the manager for PACS Laboratories and new business developer for PACS. He can be reached by e-mail at george@pacslabs.com or by calling (724) 457-6576. Barbara Sherman, BS and MBA, is the operational manager for PACS Testing, Consulting, R&D, Training and Conferences. She directs the day-to-day short courses, conference and business for PACS. She can be reached via e-mail at barb@pacslabs.com. Professional Analytical and Consulting Services, Inc. (PACS) is in its third decade of providing activated carbon services and other services to engineers and scientists. PACS provides laboratory testing, R&D, consulting, training and expert witness services. PACS also provides 59 different one-to-three day short courses for scientists. The AC tester and its applications were conceived by PACS. Additional uses for the tester will be covered at upcoming PACS conferences, including October 6 and 7, at the 24th International Activated Carbon Conference.